If this isn�t a labor of love, I don�t know what is. I had a goal: to reproduce the Fallout: New Vegas snow globes in real life. I went into this completely blind, having to develop my own methods and figure out my materials. And there was failure. My god was there failure. Some of you may remember my initial giddy post well over a year ago. I thought it was ready; things really seemed to be coming together. I was wrong, my god was I wrong. First I had ink issues. Then I had material problems. Then I had production issues. Then I had sealant issues. Nothing says failure like a cardboard box full of dud snow globes. But that�s all behind me now. No more running ink. No more warped pieces. No more free floating innards. Victory is mine. 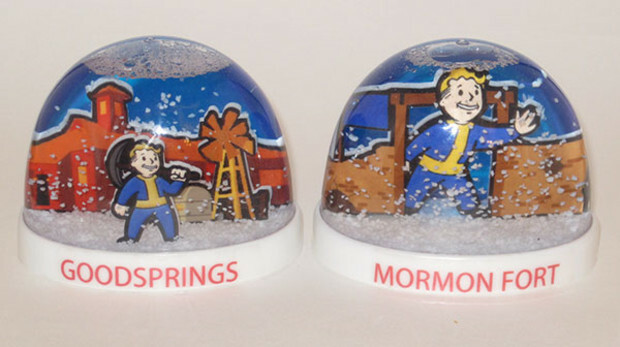 May I present the Good Springs and Mormon Fort snow globes from Fallout: New Vegas.